Your bedroom is a sacred space. It’s the place where you relax, sleep, dream, and get freaky, so it should be a room that you really enjoy spending time in. Even if your room is tiny and dark, it doesn’t have to be depressing! You don’t need to be living in a light-soaked loft to love your bedroom, I promise. Here are a few quick, easy ways to spruce up your bedroom and make it a place you want to be. What’s better than climbing into a comfortable bed with adorable bedding? Not much! In my bedroom, I have glow-in-the-dark Moon and constellation pillowcases teamed with simple IKEA bedding in stripes and dots. There’s something about a white and grey bed that is so relaxing to me! If you want to experiment with something a little more colourful, An Enchanted Life is an Australian company who do very pretty duvet covers. I love their Into The Dawn mandala and Island Sky mandala covers, plus this magic eye mandala needs to be on your bed! Ready to splurge? Linen sheets are the way to go, and they only get softer with every wash. Additionally, silk pillowcases really do make you more beautiful in the morning. This is not a myth! Be thoughtful about where you position your bed, too! There are so many ways to bring more light into your bedroom. The first step is to hang mirrors, or even replace your normal sliding closet doors with mirrored ones. This will bounce light all around your room, and make it so much brighter! One of my favourite things in our entire apartment is my double rainbow maker. It suction-cups onto the window, and is solar-powered. When the sun hits the rainbow maker, the little gears start to turn, and it projects rainbows (from fancy Swarovski crystals) all over your walls. Let me tell you, it’s really hard to be cranky when there are rainbows dancing around your room for a few hours! You can also hang a crystal ball prism in your window to get a similar effect, or if you’re a rainbow obsessive (like me), hang it up next to your rainbow maker. Double (or even triple) the joy! For nighttime, I say bring on the psychedelic! The Aurora Master projects — wait for it — ocean waves onto your ceiling, in an undulating rainbow of colours. What?! This is one of the coolest things I have ever heard of! It runs for an hour before clicking off, so it’d be perfect to set and forget just before you climb into bed. 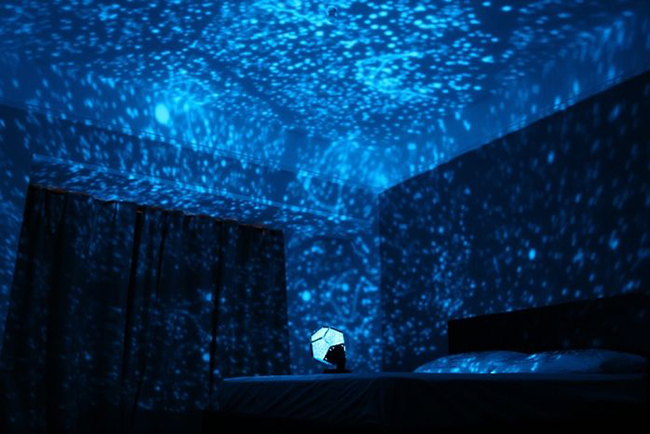 If the ocean isn’t your thing and you’d prefer the vastness of space, try a star projector! I also firmly believe every babe needs a Himalayan salt lamp in her life. They emit such a warm, pretty glow at night, and the salt is great for you, naturally clearing the air of allergens like smoke, pet danger, and pollen. It’s wonderful for your sinuses, and can help asthmatics breathe easier. Do it! 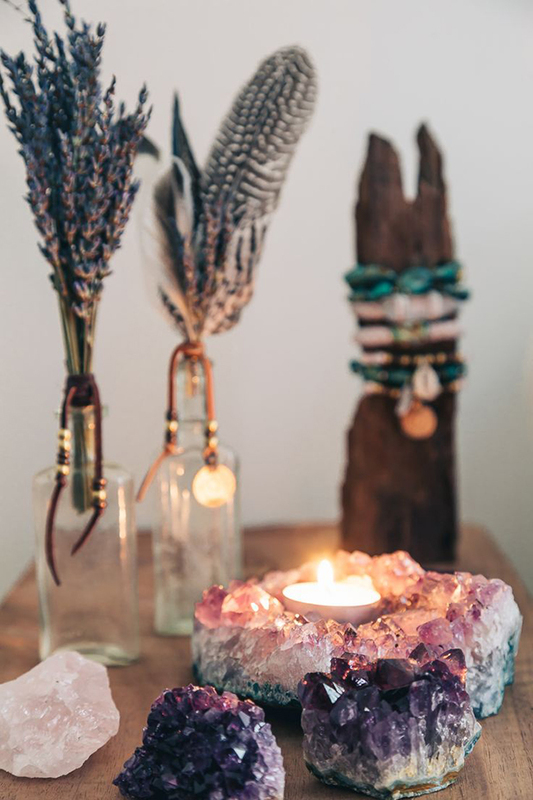 No bedroom is complete without a bottle of lavender oil. If you’ve ever had trouble sleeping, prepare for your world to change! Lavender oil is ideal when your mind is just too whizzy to drop off to sleep. I always use NOW brand: for some reason it smells so much better to me than normal lavender, and I just dot it on my neck and wrists before I get into bed. Alternatively, you can put some on a tissue and sniff it, or even put the tissue inside your pillowcase. If you’re in need of some serious rest, you can go a step beyond lavender oil with Essence Of Vali: Sleep, a blend which contains lavender, marjoram, cedarwood and ylang-ylang. They call it “A Bedtime Ritual”, which makes it sound so enticing! By the way, if you want more information on oils and how to use them, Magical Aromatherapy: The Power of Scent by Scott Cunningham is an excellent place to start. Plants never go amiss in the bedroom either: they add life, lusciousness and colour! As a bonafide magpie, I seem to naturally end up scattering shiny things around. A sequinned skirt hung on the wall, a bedazzled pair of rabbit ears propped up in a metallic pink bowl, and even mercury glass drawer pulls added to my white IKEA dresser all help to make the room a little more sassy. …But you could certainly go bigger and better than that. 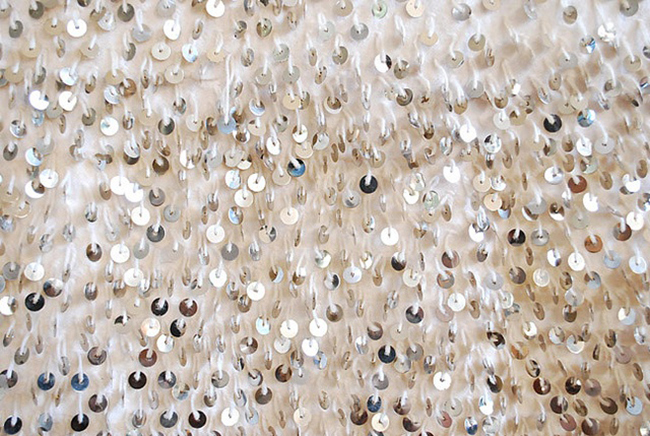 How about hanging a crystal bead curtain behind your bed, like an impromptu headboard? What if you hung a silver circle bead curtain in each window? 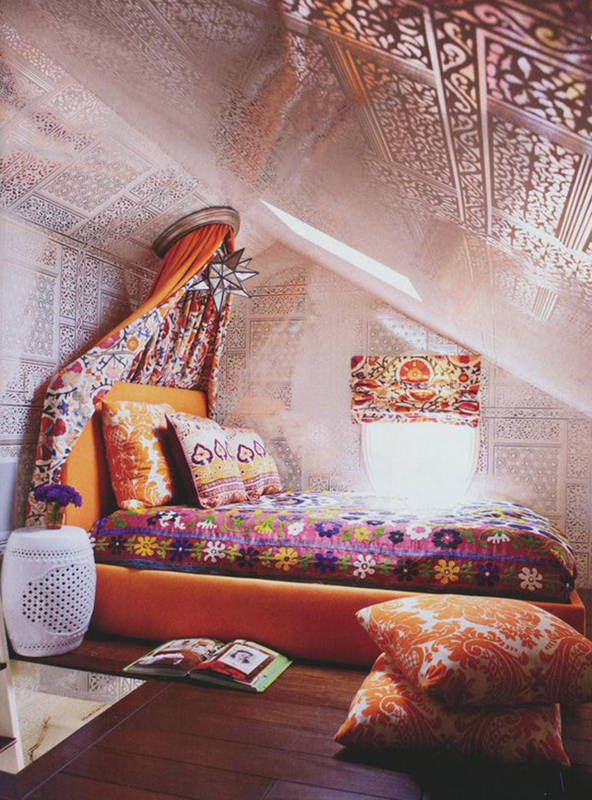 Try draping a Moroccan wedding blanket over the end of your bed. Scatter miniature disco balls along your dresser, or even install a big mirror ball above your bed! Instant party! A big stack of intriguing books that you look forward to climbing into bed and reading. Next to my bed right now are Teen Spirit, A Magick Life, and The Glitter Plan: a nice mix! A smudging stick, for banishing the ghosts of lovers past! Having said this, be sure to keep your clutter at a minimum. Unnecessary “stuff” has been proven to increase cortisol levels (aka stress levels), and that is so not the goal. Keep it calm in there! 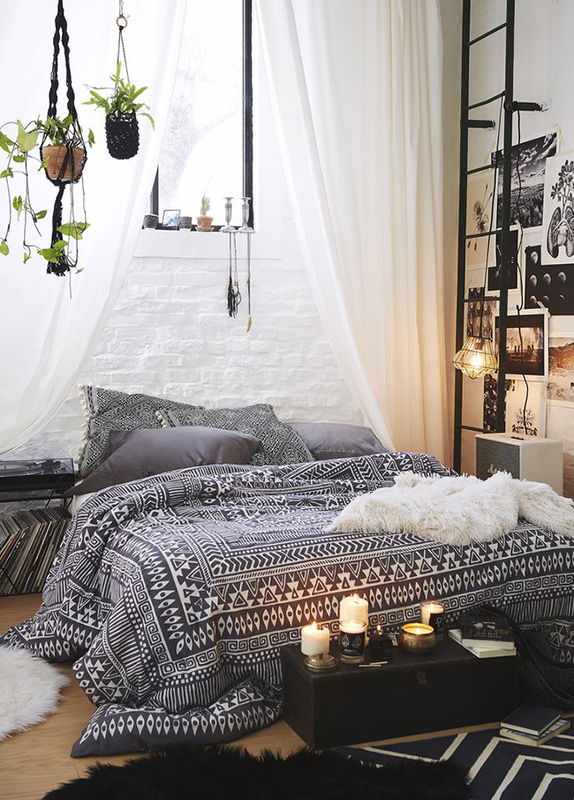 What do you do to make your bedroom feel like a magical space? I’d love to hear! P.S. Here are some more ideas to make your bedroom a happy place. Images from Lesfemmesportive, Soul Makes, Urban Outfitters, Flickr, Indie Bedrooms (great photos! ), Amazon.